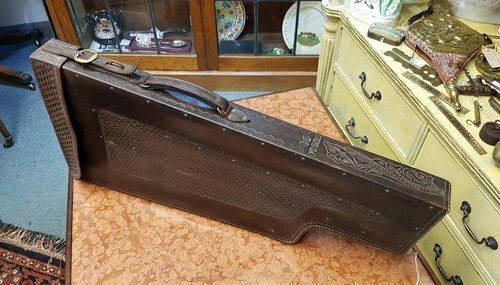 High quality hand made brown leather gun case. 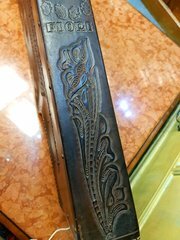 Wider and more decorated than typical ‘leg of mutton’ type cases. Beautifully decorated with floral and intricate pattern designs and the name S. Fiori. 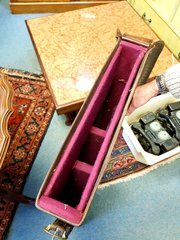 Also includes a small leather cartridge box that fits neatly inside. Mid-century piece I would suppose. Measures 86cm x 38cm x 6.8cm This item can be viewed at Amorini Antiques Centre, 1 Hamilton St, Birkenhead, Wirral, CH41 6DJ. We are open 7 days per week 10.00am-5pm. 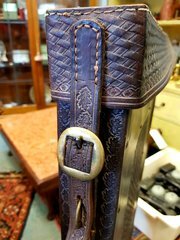 The only Antiques Centre on Wirral, Amorini Antiques Centre, has 10 rooms over three floors and stocks a huge range of antiques, vintage, shabby chic and retro items including silver, furniture, ceramics, paintings, glass, militaria, taxidermy, jewellery and collectables. 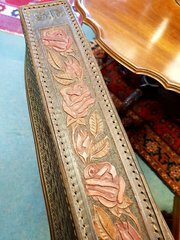 Amorini Antiques also has a trade warehouse on Wirral. Please contact us if you are looking for something in particular. We also undertake commissions and buy single items or full collections and provide a discreet, professional house clearance service.